Today, much like in Paul’s days, the supremacy and sufficiency of Christ have been challenged by a number of different heresies. Paul wrote the letter to the Colossians in the middle of the first century to oppose a false teaching known as the Heresy of Colossae. 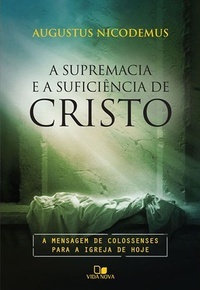 However, the attentive reader familiarized with the evangelical Brazilian Church will easily be able to identify various similarities to this heresy in the present day. It opposes four tendencies of Paul’s time that still devastate the church, which are part of many theologies defended in our current days, namely, Gnosticism, Legalism, Mysticism and Asceticism; Paul’s response to the Heresy of Collossae was the supremacy and sufficiency of the person and work of Jesus Christ. Augustus Nicodemus believes that this is the message that urgently needs to be preached in the Brazilian pulpits, that is, Christ, the Lord.